Thanksgiving is this week and for many families that not only means gathering for a big holiday dinner, but also crowding around a television for a day of watching pro football. The Detroit Lions have been playing on Thanksgiving Day since 1934, so watching is a Michigan tradition. However, if you grew up in Flint back in the day, as I did, Thanksgiving meant one thing – leaving the confines of your house to attend a high school football game. Let me put on my geezer hat and return with you to those thrilling days of yesteryear. It's time for a Thanksgiving story. At one time there were just two public high schools in Flint – Central and Northern. The city was divided, you were either a Central fan or a Northern fan. My parents attended Flint Northern, my uncle and aunt went to Northern, the parents of one of my best friends whose back yard touched my backyard graduated from Northern. The Neffs were a Flint Northern Vikings , red and gray family. We had no use for the despised Flint Central Indians in their red and black. The games were staged in Atwood Stadium near downtown Flint. Atwood was built in 1926 on a former dump site. 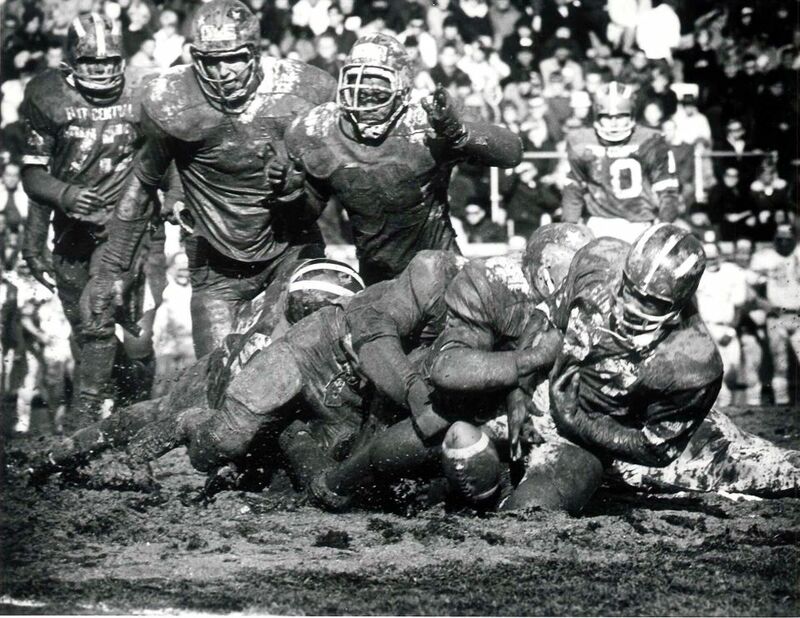 It was legendary for its poor turf, which ranged from frozen tundra to a mud bog, depending on the weather. Most of the time the game was played in cold conditions and I remembering putting on several layers of clothing to brave the elements for the traditional noon kickoff. For many, the warmest things they owned were deer hunting outfits, so function over fashion ruled the day. Once you were there, the Turkey Day event was an extravaganza. The Central and Northern marching bands were each over 100 members strong. Who would play the most rousing music and have the most intricate marching patterns? 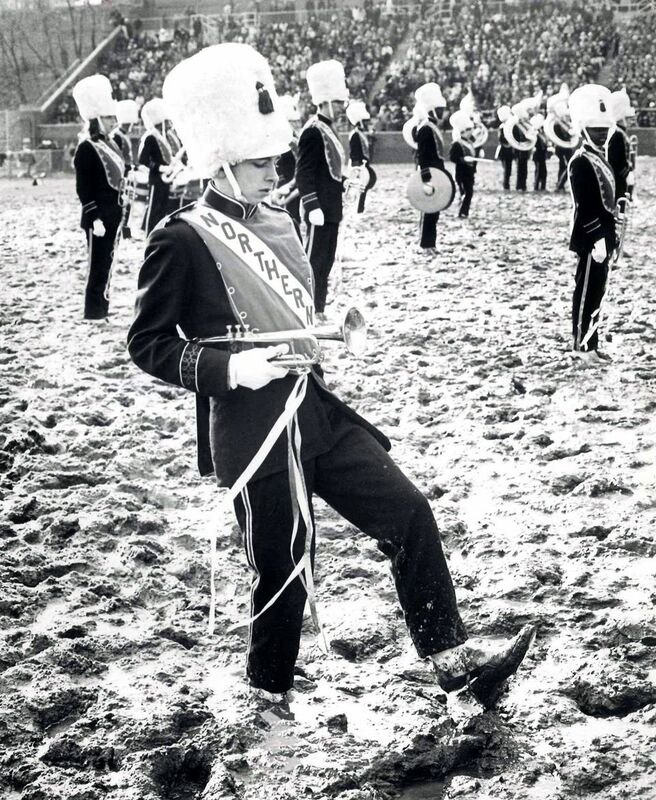 Whose drum majors would be the highest steppers? Which fight song would elicit the biggest reaction? The battle of the bands at halftime was as intense as the football game. The Northern cheering section was behind the west end zone and Central's was behind the east end zone. The card sections always strove to have the most unique displays. Which school's cheerleaders would fire up their student body to produce the loudest cheers? And who can forget the infamous Pig Incident of 1962? A pig colorfully beribboned in Central's red and black was let loose in front of Northern's section. Ah, but the game was the main thing. You could always tell the teams apart by just their helmets. Northern's were red and gray leather with a cross on top, patterned after the helmets of Notre Dame. Central used the University of Michigan design with a black background, a wing of red, and three white stripes. I remember that after the game we'd hustle home to thaw out and maybe catch the last quarter of the Lions' game on TV. After dinner, the kids in our neighborhood would gather and replay the Northern-Central game until the street lights came on. What a day! Flint Central and Flint Northern no longer exist. Atwood Stadium, however, has seen a rebirth. It is now under the guardianship of Kettering University (formerly General Motors Institute). I recently visited Atwood, and it is better than ever. “With the help of the Friends of Atwood Stadium, Kettering raised funds to make critical upgrades to the stadium before the grand re-opening in August 2015.” It is back to hosting football games, soccer games, and special events. See videos of this transformation at: https://www.kettering.edu/about/atwood-stadium and https://youtu.be/qjBWn5NGxZk. So, that's my Thanksgiving story. To kick off the holiday season, I have once again created a special Holidays Page with all sorts of activities, games, jokes, crafts, and other family fare at: https://www.neffzone.com/holidays/. Enjoy your Thanksgiving and remember to save some turkey for the next day. You'll want to make the best sandwich in the universe – turkey and peanut butter on cheap white bread.